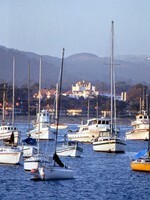 Left Coast Crime 2004 - Visit Monterey! Since the 1880s, visitors have been enjoying the spectacular beauty of the Central Coast. Located between Los Angeles and San Francisco, Monterey County's dramatic ocean scenery, pristine pine forests, and historic communities continue to beckon adventure-seekers, seafarers, artists, writers and vacationers. And no other California county can boast 99 miles of breathtaking Pacific coastline. Why not spend a few extra days in Monterey before or after Left Coast Crime 2004 and explore this beautiful, exciting area? 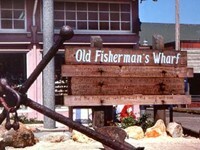 Our convention hotel, the DoubleTree, is located just steps from Fisherman's Wharf. World-famous attractions like Big Sur, Carmel-by-the-Sea, the 17-Mile Drive and Pacific Grove ("Butterfly Town, USA") are just a short distance away. Visit the Monterey County Convention & Visitors Bureau web site at montereyinfo.org for more information and suggestions on how to make the most of your Monterey vacation! The site includes information on attractions, local restaurants and the county's award-winning wineries, and a calendar of activities and events. MONTEREY MYSTERIES: Before visiting Monterey, why not read a mystery set in the area? Here is a list of Monterey Mysteries, compiled by Janet A. Rudolph. DINING IN MONTEREY: Restaurant recommendations by Left Coast Crime committee members, friends and local residents. MONTEREY ON SCREEN: The Monterey County Film Commission web site has a list of almost 200 films featuring scenes filmed in Monterey County. TRANSPORTATION & TOURS: This page has information on how to get to Monterey, along with tips on getting around town by bus, taxi or car. Here is a map with directions to the DoubleTree hotel. WEATHER INFORMATION: What is the weather like in Monterey?